Abstract: Nanoscale ZnO is one of the best choices for ultraviolet (UV) protection, not only because of its antimicrobial properties but also due to its potential application for UV preservation. However, the behavior of nanostructured thin ZnO films and long-term effects of UV-radiation exposure have not been studied yet. 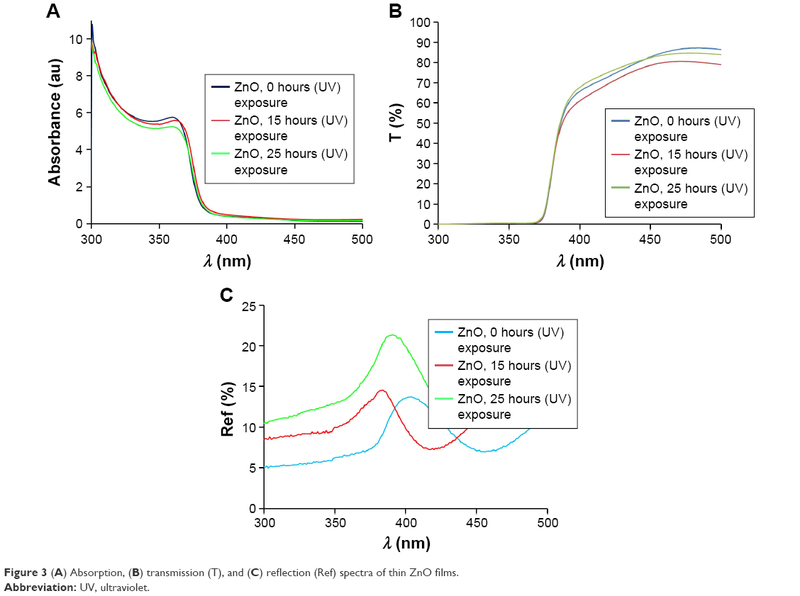 In this study, we investigated the UV-protection ability of sol gel-derived thin ZnO films after different exposure times. Scanning electron microscopy, atomic force microscopy, and UV-visible optical spectroscopy were carried out to study the structure and optical properties of the ZnO films as a function of the UV-irradiation time. The results obtained showed that the prepared thin ZnO films were somewhat transparent under the visible wavelength region and protective against UV radiation. The UV-protection factor was 50+ for the prepared samples, indicating that they were excellent UV protectors. The deposited thin ZnO films demonstrated promising antibacterial potential and significant light absorbance in the UV range. The experimental results suggest that the synthesized samples have potential for applications in the health care field. In recent years, the destruction of the ozone layer in the earth’s atmosphere has led to an increased risk to human, plant, and animal life. Since ultraviolet (UV) radiation triggers the formation of free radicals, the long-term exposure of human skin to UV radiation can result in health issues, such as aging, DNA damage, skin reddening, acne, and even skin cancer.1 This indicates that UV radiation is one of the main sources of free radicals, leading to direct biological damage and different types of cancer. 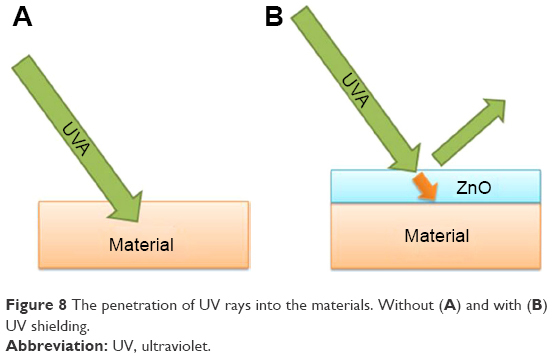 In addition, UV radiation-induced damage can be associated with the discoloration of dyes and pigments, weathering, yellowing of plastics, and loss of gloss and mechanical properties (cracking) as well.2 Consequently, several products must be protected to sustain long periods under UV radiation.3–5 Therefore, the study and development of UV-protective materials has become a very important issue. To be a UV-absorbing material, several features, including high transparency, high UV-absorption coefficient, high photostability, and affordability, must be present. There are inorganic and organic UV absorbers commercially available. Organic UV absorbers have been used to protect organic materials against UV radiation. However, the low stability of the polymer matrices commonly used to embed the absorbers upon UV irradiation limits their application severely.6,7 In order to provide an effective protection against UV radiation, one of the requirements of UV-absorber molecules is the ability to transform the absorbed radiation energy in less damaging thermal energy via a photophysical process.8 With regard to delamination and the time it takes to occur (closely related to the dose of UV radiation reaching the substrate or primer), organic UV absorbers are not permanent, and their photodegradation is an important factor in determining coating lifetime.9 Inorganic materials based on metal oxide semiconductors can efficiently absorb UV radiation and exhibit good heat-resistance properties. They are used as transparent inorganic matrices or embedded in polymers as UV absorbers. It should be noted that the use of nanoscale inorganic materials leads to an increase in stability of protective coatings, with highly efficient UV absorption. Naturally, the band gap of nanoscale inorganic materials must be suitable for UV-radiation absorption. For example, TiO2 has a band gap with an optical absorption in the ~310–400 nm-wavelength region, and its absorption does not cover the entire UV region (especially the dangerous region of 290–350 nm).10 On the other hand, CeO2 (Eg=3.1 eV) can absorb light in the entire UV region, but its strong yellowish coloration limits its use in color-sensible applications, such as artwork protection.11 However, ZnO with a wide band gap (Eg=3.37 eV, corresponding to 376 nm) has unique electrooptical properties and efficient UV absorptivity combined with good transparency in the visible range (because it absorbs light that matches or exceeds its band-gap energy).12–15 It can be used as a packaging material for UV white-light-emitting diodes that require both high visible-light (>400 nm) transparency and high UV-light (<400 nm) resistance.16 As reported by Li et al,16 high UV-light resistance of packaging materials may be achieved via structural design of transparent epoxies and addition of organic or inorganic UV-light absorbents. UV absorbents (eg, ZnO) do not typically migrate in a polymeric matrix, and their photostability and thermal stability provide advantages, such as being stable and nonmigratory within a matrix, and thus potentially impart better effectiveness and longer service life. 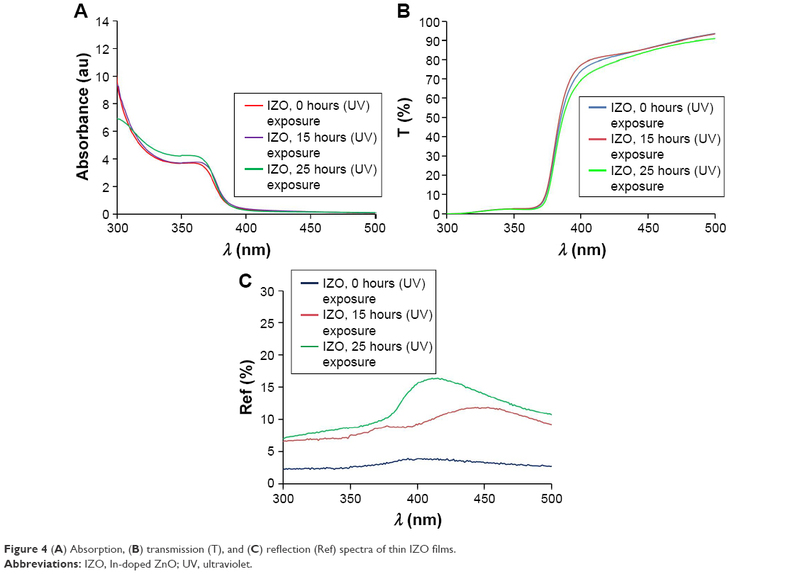 In comparison with other UV-protection candidates, ZnO is advantageous, due to its protection over long periods, broadband protection, and nonwhitening of skin.17 The use of materials with UV-protection properties is typically based on optical scattering and/or absorption.18 On the other hand, the UV-blocking ability of nanoscale ZnO also depends on its size and morphology. Therefore, ZnO nanoparticles with different sizes and morphologies have different UV-blocking properties.19 ZnO nanoparticles absorb UV radiation and transform it in harmless infrared light, which is dissipated as heat. It must be noted that the inability to achieve 100% efficiency in heat conversion of UV light leads to the creation of free radicals and results in oxidative damage to DNA.20 Several studies have reported improved UV blocking for materials containing ZnO nanoparticles.21–25 Recently, an anti-UV fiber coated with ZnO nanopowders was developed, possessing UV-shielding, antibacterial, and sterilization properties.26,27 Moreover, nanosize ZnO particles deposited on cotton and polyester/cotton products indicate a significant improvement in UV-absorbing activity, with a UV-protection factor (UPF) of 15.28 Tsuzuki studied the photoactivity of ZnO nanoparticles via impurity doping, and reported that ZnO is a safe UV-blocking agent for several applications.29 In other similar studies, a multilayer ZnO film was deposited on cotton, providing a UPF of ~12. In order to increase UPF value, copolymer/ZnO has been coated on cotton textiles.30 The morphology of these compounds is very important to determine their utilization as UV-radiation absorbers. Nanostructured thin ZnO films are mainly used as UV-protection filters, installed in devices and packages. However, thin ZnO films have high transparency in the visible range and high absorption in the UV range. Recently, it has been reported that a multilayer ZnO film deposited on cotton could provide a UPF of ~12. To achieve a UPF of 50+, a copolymer film coated on cotton textile was used.31 In this study, a simple and low-cost method was developed to prepare transparent nanoscale thin ZnO films with a UPF of 50+. The synthesized sample can be easily coated on different types of plastics, textiles, glasses, cosmetics, and other products for UV protection. Therefore, our investigation can be applied in the future to other systems. In this study, thin ZnO films were prepared using a sol-gel method on glass substrates, and the structural and optical properties of these films were studied using X-ray diffraction (XRD), atomic force microscopy (AFM), and UV-visible spectrophotometry. For the ZnO-nanoparticle preparation, the precursor used was zinc acetate dihydrate (ZnAc; Zn[C2H3O2]2·2H2O, 99.5%; Merck Millipore, Billerica, MA, USA), and indium(III) chloride, aluminum acetate, and lithium acetate were used as doping sources. Pure ethanol and triethanolamine (TEA) were used as solvent and stabilizer, respectively. Indium(III) chloride, aluminum acetate, and lithium acetate were purchased from Sigma-Aldrich (St Louis, MO, USA). Reagent-grade ethanol with 99.9% purity was used. The triethanolamine:ZnAc molar ratio was maintained at 2:5. Additional details of the preparation process have been reported elsewhere.32,33 The nanostructured thin ZnO films were prepared using a dip-coating method. In this approach, the glass substrates were washed with acetone and absolute ethanol for 10 minutes. The film deposition was carried out in air at room temperature using a dip-coating method on the substrate at a controlled speed of 1.8 cm/min. After each coating, the films were preheated at 70°C for 1 hour and postheated at 500°C for 2 hours. UV spectra were measured using UV-visible spectrophotometry (Cary 500; Agilent Technologies, Santa Clara, CA, USA) to study the optical properties of the films. XRD patterns were obtained with a PW 3050-60 (PANalytical, Almelo, the Netherlands) at room temperature, and 2θ values were measured between 10° and 90° to investigate the crystal structure. The incident wavelength was 1.54059 Å. To study the morphology, roughness, and grain size of the thin ZnO film, an AFM CP Research (Veeco, Plainview, NY, USA) was used. To study the surface morphology and grain size of the synthesized thin In-doped ZnO (IZO) film, scanning electron microscopy (SEM) was used. To determine the chemical homogeneity and composition of the thin ZnO film, energy-dispersive X-ray spectroscopy (EDX) analysis was also carried out. The samples were irradiated with broad radiation from a UV source (Bio-Sun; Vilber, Collégien, France) according to the ideal conditions listed for UV protection (ISO 2443:2012). 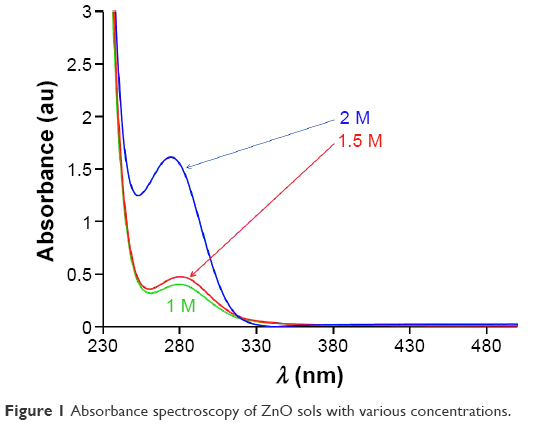 Figure 1 Absorbance spectroscopy of ZnO sols with various concentrations. Figure 2 (A) Absorption and (B) transmission (T) spectra of ZnO sols with various dopant ions. Abbreviations: IZO, In-doped ZnO; LZO, Li-doped ZnO; AZO, Al-doped ZnO. 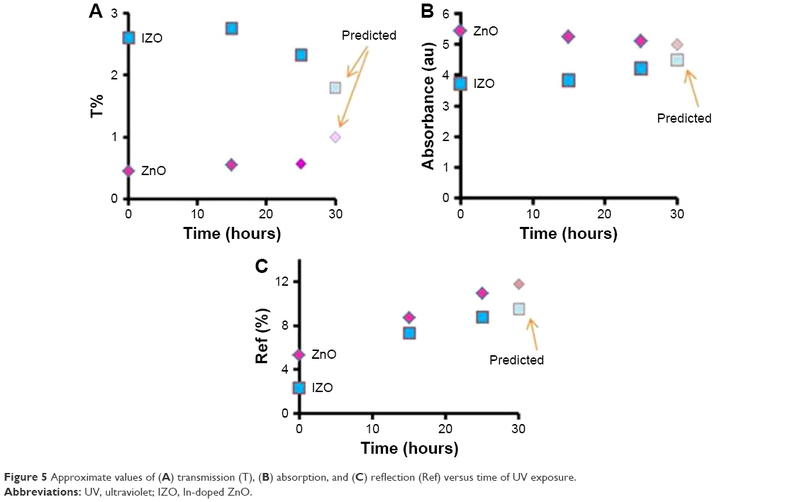 Figure 3 (A) Absorption, (B) transmission (T), and (C) reflection (Ref) spectra of thin ZnO films. Figure 4 (A) Absorption, (B) transmission (T), and (C) reflection (Ref) spectra of thin IZO films. Abbreviations: IZO, In-doped ZnO; UV, ultraviolet. Figure 5 Approximate values of (A) transmission (T), (B) absorption, and (C) reflection (Ref) versus time of UV exposure. Abbreviations: UV, ultraviolet; IZO, In-doped ZnO. Figure 6 (A) SEM image and (B) energy-dispersive X-ray pattern of thin IZO film. The inset of (B) shows the X-ray diffraction pattern of IZO-TF. Abbreviations: SEM, scanning electron microscopy; IZO, In-doped ZnO; TF, thin film. 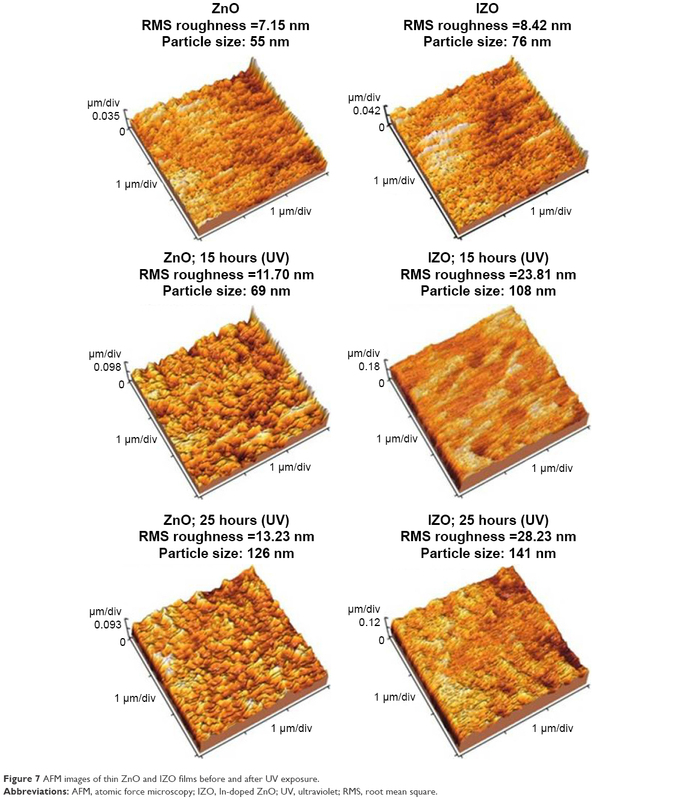 Figure 7 AFM images of thin ZnO and IZO films before and after UV exposure. Abbreviations: AFM, atomic force microscopy; IZO, In-doped ZnO; UV, ultraviolet; RMS, root mean square. Figure 8 The penetration of UV rays into the materials. Without (A) and with (B) UV shielding. Abbreviations: RMS, root mean square; UV, ultraviolet; IZO, In-doped ZnO. Abbreviations: UPF, UV-protection factor; UV, ultraviolet. where λ is the wavelength in the 320–400 nm range, Sλ the solar spectral irradiance at wavelength λ, Eλ the energy thermal spectral effectiveness at wavelength λ, and Tλ the product transmission at wavelength λ. The UPF data were calculated based on the reference spectra according to the American Association of Textile Chemists and Colorists test method 183.46 UPF values for the UVA range were calculated according to Equation 4, and were ~40–45 and ~45–50 for the ZnO and IZO samples, respectively. The In-loaded samples had higher protection against UV radiation, and presented “excellent” UV shielding. These results confirmed that the best protection against UV radiation was obtained with nanostructured thin IZO films. Therefore, we can protect different products (to sustain long periods under UV radiation) by using a protective coating. Skin protection against UV radiation can also be achieved by textiles coated with IZO.47 This kind of protection can be used for both smart and artificial skins.48 Occasionally, people that are exposed to the sun do not have access to shade or sunscreen, or might have a particular sensitivity to these sunscreens; in this case, the best solution is using the appropriate cover for our skin. An artificial skin can be used for protecting the skin temporarily. There are several different types of artificial skins, ranging from sheets of human skin grown from the patient’s own cells to others entirely synthetic, designed to act as a support so that the body can grow its own skin as it heals. Manufacturing transparent coatings (similar artificial skins), based on UV-absorbing nanoparticles, can represent a big step in the prevention of skin cancer. As we have mentioned, UV radiation is one of the most important factors in maintaining skin health, so it is better to know more about UV radiation. In summary, transparent thin ZnO films with high UV light-shielding efficiency were reported in this study using a simple and low-cost method. A highly concentrated pure ZnO sol (2 M) was prepared with In impurities as a suitable candidate to study optical properties against UV irradiation. The effect of UV irradiation on the optical properties of the nanostructured thin ZnO and IZO films was investigated. The obtained results showed that the prepared thin IZO films were somewhat transparent under the visible-wavelength region and were protective against UV radiation. The UPF was 50+ for the prepared samples, showing excellent UV protection. We can postulate that thin IZO film can be used as a UV-blocking material and find application as a UV absorber in cosmetics, packages, textiles, and protective coatings. This research was supported by a National Research Foundation of Korea (NRF) grant funded by the South Korean government (MSIP 2015R1A2A1A15054541), and by the third stage of Brain Korea 21 Plus Project in 2016. El-Shafei A, Abou-Okeil A. ZnO/carboxymethyl chitosan bionano-composite to impart antibacterial and UV protection for cotton fabric. Carbohydr Polym. 2011;83:920–925. Parejo PG, Zayat M, Levy D. Highly efficient UV-absorbing thin-film coatings for protection of organic materials against photodegradation. J Mater Chem. 2006;16:2165–2169. Hayoz P, Peter W, Rogez D. A new innovative stabilization method for the protection of natural wood. Prog Org Coat. 2003;48:297–309. Piegari A, Polato P. Wideband optical coatings for protecting artwork from ultraviolet and infrared radiation damage. J Opt A Pure Appl Opt. 2003;5:152–156. Broascaa G, Borciab G, Dumitrascub N, Vrinceanua N. Characterization of ZnO coated polyester fabrics for UV protection. Appl Surf Sci. 2013;279:272–278. Hattori H, Ide Y, Sano T. Microporous titanate nanofibers for highly efficient UV-protective transparent coating. J Mater Chem A Mater Energy Sustain. 2014;2:16381–16388. Girois S, Delprat P, Audouin L, Verdu J. Kinetic study of the photostabilisation of polypropylene films by an hydroxyphenylbenzotriazole. Polym Degrad Stab. 1999;64:107–114. Pospsil J, Nespurek S. Photostabilization of coatings: mechanisms and performance. J Prog Polym Sci. 2000;25:1261–1335. Pickett JE. UV absorber permanence and coating lifetimes. J Test Eval. 2004;32:240–245. Aarik J, Aidla A, Kiisler AA, Uustare T, Sammelselg V. Effect of crystal structure on optical properties of TiO2 films grown by atomic layer deposition. Thin Solid Films. 1997;305:270–273. Cui H, Zayat M, Parejo P, Levy D. Highly efficient inorganic transparent UV-protective thin-film coating by low temperature sol-gel procedure for application on heat-sensitive substrates. Adv Mater. 2008;20:65–68. Kushwaha OS, Avadhani CV, Singh RP. Preparation and characterization of self-photostabilizing UV-durable bionanocomposite membranes for outdoor applications. Carbohydr Polym. 2015;123:164–173. Rajagopalan N, Khanna AS. Effect of size and morphology on UV-blocking property of nanoZnO in epoxy coating. Int J Sci Res Publ. 2013;3:1–14. Eita M, Wagberg L, Muhammed M. Spin-assisted multilayers of poly(methyl methacrylate) and zinc oxide quantum dots for ultraviolet-blocking applications. ACS Appl Mater Interfaces. 2012;4:2920–2925. Becheri A, Dürr M, Lo Nostro P, Baglioni P. Synthesis and characterization of zinc oxide nanoparticles: application to textile as UV-absorbers. J Nanopart Res. 2008;10:679–689. Li YQ, Fua SY, Mai YW. Preparation and characterization of transparent ZnO/epoxy nanocomposites with high-UV shielding efficiency. Polymer. 2006;47:2127–2132. Calvo ME, Smirnov JR, Miguez H. Novel approaches to flexible visible transparent hybrid films for ultraviolet protection. J Polym Sci B Polym Phys. 2012;50:945–956. Rusdi R, Rahman AA, Mohamed NS, Kamarudina N, Kamarulzaman N. Preparation and band gap energies of ZnO nanotubes, nanorods and spherical nanostructures. Powder Technol. 2011;210:18–22. Lee YJ, Ruby DS, Peters DW, McKenzie BB, Hsu JW. ZnO nanostructures as efficient antireflection layers in solar cells. Nano Lett. 2008;8:1501–1505. Tsuzuki T, Wang X. Nanoparticle coatings for UV protective textiles. Res J Text Apparel. 2010;14:9–14. Cakir BA, Budama L, Topel O, Hoda N. Synthesis of ZnO nanoparticles using PS-b-PAA reverse micelle cores for UV protective, self-cleaning and antibacterial textile applications. Colloids Surf A Physicochem Eng Asp. 2012;414:132–139. Ge JL, Zeng XF, Tao X, et al. Preparation and characterization of PS-PMMA/ZnO nanocomposite films with novel properties of high transparency and UV-shielding capacity. J Appl Polym Sci. 2010;118:1507–1512. Wang MY, Sun XY, Mao ZP. Application of TiO2 nano-sol in anti-UV finishing of cotton fabrics. Text Aux. 2004;21:22–24. Huang C, Yang FS, Wang H, Zhang HJ, Zhang L. Anti-ultraviolet finishing of cotton fabrics with nano-TiO2 and nano-SiO2. J Text Res. 2006;27:12–15. Hong RJ, Huang JB, He HB, Fan ZX, Shao JD. Optical nonlinearity of ZnO microcrystallite enhanced by interfacial state. Opt Express. 2005;13:9211–9216. Zu Y, Lei Y, Wang X, Wu J, Zeng Q. Unique uses of nanometer ZnO. New Chem Mater. 2001;27:14–16. Niu QX, Liu YJ, Song DJ, Gao YJ, Dai CL, Yang HW. Research of anti-ultraviolet nano-film structure based on the FDTD method. Optik (Stuttg). 2016;127:539–543. Kathirvelu S, D’Souza L, Dhurai B. UV protection finishing of textiles using ZnO nanoparticles. Indian J Fibre Text Res. 2009;34:267–273. Tsuzuki T, He R, Wang J, Sun L, Wang X. Reduction of the photocatalytic activity of ZnO nanoparticles for UV protection applications. Int J Nanotechnol. 2012;7:1017–1029. Uğur S, Sariişik M, Aktaş AH, Uçar MC, Erden E. Modifying of cotton fabric surface with Nano-ZnO multilayer films by layer-by-layer deposition method. Nanoscale Res Lett. 2010;5:1204–1210. Mao Z, Shi Q, Zhang L, Cao H. The formation and UV-blocking property of needle-shaped ZnO nanorod on cotton fabric. Thin Solid Films. 2009;517(8):2681–2686. Vafaee M, Ghamsari MS. 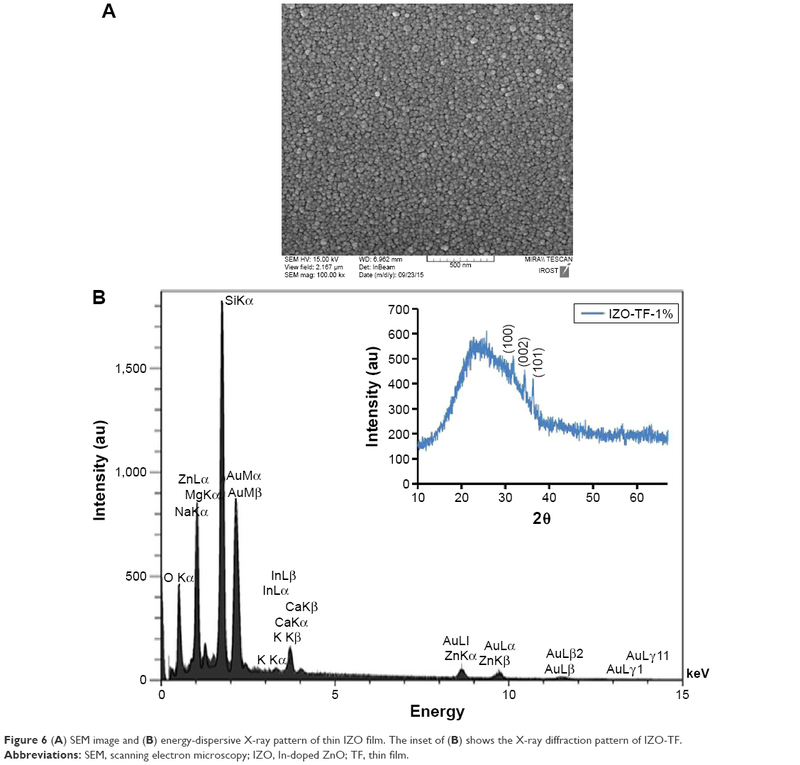 Preparation and characterization of ZnO nanoparticles by a novel sol-gel route. Mater Lett. 2007;61:3265–3268. Vafaee M, Ghamsari MS, Radiman S. Highly concentrated zinc oxide nanocrystals sol with strong blue emission. J Lumin. 2011;131:155–158. Efafi B, Ghamsari MS, Aberoumand MA, Ara MH, Rad H. Highly concentrated ZnO sol with ultra-strong green emission. Mater Lett. 2013;111:78–80. Efafi B, Ghamsari MS, Aberoumand MA, Ara MH, Ghamsari AH, Rad HH. Aluminum doped ZnO sol-gel derived nanocrystals: Raman spectroscopy and solid solubility characterization. Phys Status Solidi A Appl Res. 2014;211:2426–2430. Alamdari S, Ghamsari MS, Ara MH, Efafi B. Highly concentrated IZO colloidal nanocrystals with blue/orange/red three-colors emission. Mater Lett. 2015;158:202–204. More BD. Physical sunscreens: on the comeback trail. Indian J Dermatol Venereol Leprol. 2007;73:80–85. AlHammad MS. Nanostructure hydroxyapatite based ceramics by sol gel method. J Alloys Compd. 2016;661:251–256. Tsuzuki T, Robinson JS, Mccormick PG. UV-shielding ceramic nanoparticles synthesized by mechanochemical processing. J Aust Ceram Soc. 2002;38:15–19. Vajargah PH, Abdizadeh H, Ebrahimifard R, Golobostanfard MR. Sol-gel derived ZnO thin films: effect of amino-additives. Appl Surf Sci. 2013;285:732–743. Kim YK, Min DH. UV protection of reduced graphene oxide films by TiO2 nanoparticle incorporation. Nanoscale. 2013;5:36–38. Schlossman D, Shao Y. Using TiO2 and ZnO for balanced UV protection. 2008. Available from: http://www.koboproductsinc.com/Downloads/(q)TiO2_ZnO_UV_Bal_InCos08.pdf. Accessed December 1, 2016. Padmavathy N, Vijayaraghavan R. Enhanced bioactivity of ZnO nanoparticles: an antimicrobial study. Sci Technol Adv Mater. 2008;9:035004. Gies HP, Roy CR, Elliott G, Wang Z. Ultraviolet radiation factors for clothing. Health Phys. 1994;67:131–139. American Association of Textile Chemists and Colorists. AATCC 183: Transmittance or blocking of erythemally weighted ultraviolet radiation through fabrics. 2014. Available from: http://standards.globalspec.com/std/9895207/aatcc-183. Accessed December 1, 2016. Dastjerdi R, Montazer M, Shahsavan S. A novel technique for producing durable multifunctional textiles using nanocomposite coating. Colloids Surf B Biointerfaces. 2010;81:32–41. Sun T, Qing G. Biomimetic smart interface materials for biological applications.Adv Mater. 2011;23:H57–H77.